What is cross country soaring? It is flying as one imagined it as a child. It is to soar silently for great distances, above the countryside and among the clouds. It is to look down on spectacular changing scenery, as you travel 200 miles or more in a single afternoon. Cross country soaring is possible because of the powerful energy released when sunshine warms the ground faster than the nearby air. In the hands of a skilled pilot, a modern glider can climb from one to five thousand feet in six minutes and then glide more than 40 miles. By linking such climbs, glider pilots make long out and return flights from Booker regularly throughout the summer. Our members have soared from Booker to Snowdon, Lands End and back. These natural forces, our pilots' skill and modern club equipment enable us to race each other in comfort and safety. Unlike hot air balloons that land wherever the wind takes them, our races finish back at Booker. We de-brief and swap stories over a drink and bbq in the evening sunshine. When on occasion a pilot lands their glider away, whether at another airfield or safely in a farmer's field, there are always other willing pilots ready to make the recovery. Lasting friendships are forged by such memorable trips and at Booker no pilot gets left behind. Completing epic flights and competing in close races is the goal of many motivated pilots. At Booker our members also enjoy the necessary stepping stones needed to reach that goal. 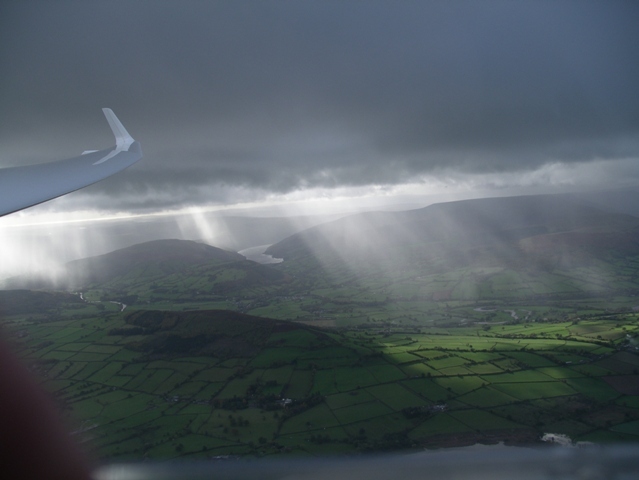 Members who fly cross country have access to their own dedicated web forum on which expert weather forecasts and encouragement are shared by enthusiastic members in advance of any promising weather conditions. The banter on the forum, as at the club, is part of the members' spirit to spur each other on to better flying and achievement. Our members share know-how and skills in the classroom, on the field, and in flight. Lectures and individual mentoring allow motivated pilots to plan and develop their soaring expertise at their own pace. Each weekend, past national champions and current international gliding competitors set co-operative racing tasks which enable all pilots to compete in club equipment or private gliders of all types. Tasks, including handicapped Grand Prix, Assigned Area Tasks and classic 28% triangles, are set to challenge the experts and maximise the beginners' chance of improving. Efficient radio work enables stragglers to avoid "bad air" and catch up while also enabling co-operative team gliding. The Club's sleek Duo Discus two seater is used for cross country instruction - a fast way to learn techniques from experienced and skilled pundits - while the club's modern single seat gliders are always available to all members for extended cross country flights. Why fly cross country from Booker? Soaring and racing is a new challenge for existing or aspiring pilots. To be successful at it requires a rare mix of skills - throughout the flight - including both fluffy "seat of the pants" flying instincts and clear sighted, focused, decision making. Booker enjoys a superb location for soaring in this country. Cross country flying is often possible from Booker when other areas are grounded by sea breeze or cloud cover. Moreover the friendly club is full of enthusiastic members who fly with purpose and defer "rules based thinking" for "pilot led decision making". Whether you would be learning new skills or mastering old ones come join us for some cross country gliding. Sign up for the XC forum and be ready to immerse yourself in an addictive and immensely rewarding sport. Webmaster John P. This Page authored by Jane M.